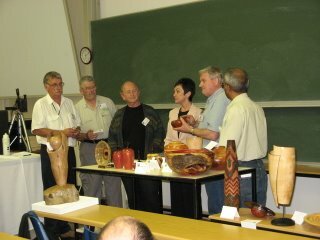 The 2007 Congress is being hosted by the Western Cape Woodturners Association. A map of central Cape Town - Jan van Riebeeck High School is on the south east corner of Kloof Street and Camp Road. Registration will open on Thursday 26th April at around 14h00. Registration will again open early (07h30) on Friday 27th April for the late arrivals and day visitors, and again at 07h30 on Saturday 28th and Sunday 29th April for day visitors. 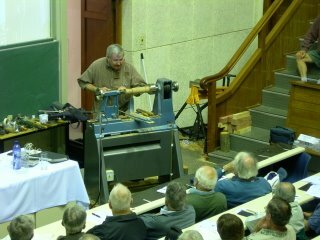 The congress proper will kick off at 08h30 on Friday 27th April, and will continue until lunchtime on Sunday 29th April. The congress will consist of a mix of demonstrations and panel discussions. Bonnie Klein from the USA is the invited guest turner. 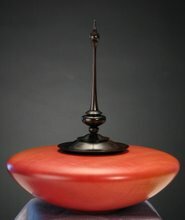 Bonnie’s speciality is boxes with threaded lids, in addition to developing and producing her own small lathe and accessories. 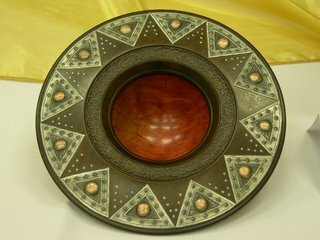 Bonnie has been seriously involved with woodturning since the early 1980’s. In 1986 she designed the small Klein Lathe which has been in production for over 20 years. In 1992 she introduced the Threading Jig as an accessory to the lathe for cutting threads in wood. Bonnie has produced 5 turning videos which have now been converted to DVD’s. 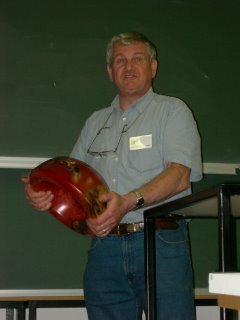 In 2005 wrote a woodturning project book. 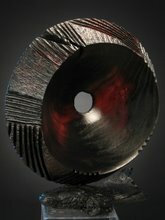 She has demonstrated and taught workshops in many countries as well as all over the USA. 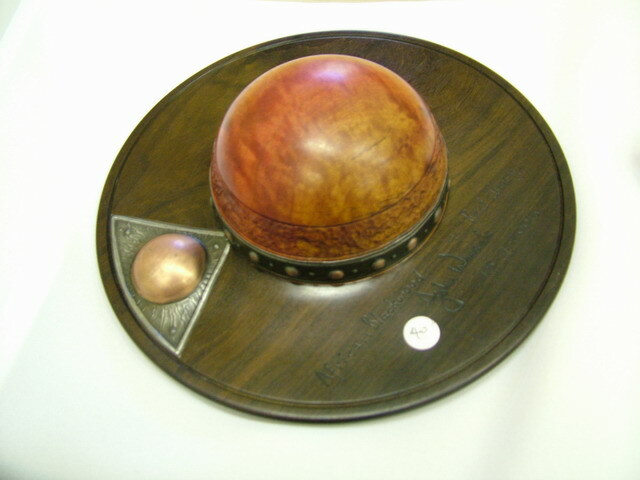 In 2003 the American Association of Woodturners recognized her as an Honorary Lifetime Member in recognition of her contributions to woodturning. Other than Bonnie's threaded boxes pictured here, attractions will include a demonstration on chainsaw use and blank preparation, a demo on vacuum chucking, a presentation on design and inspiration by Peter Nicolle and Dennis Laidler, a demonstration by Attie van der Colff, who has overcome the challenge of only having one arm to make a living, in addition to several other demos. The congress will end off with a collaboration session where all participants will have an opportunity to work each other on a project that will be annouced at the congress. The pre-final programme is now available. The programme will be completed as the organisers finalise the demonstrators. 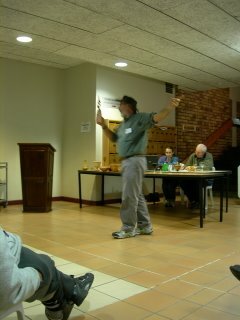 There will be four sessions daily, starting at 08h30 in the morning, and finishing at 17h00. On Friday night, supper will be followed by a critique of the instant gallery pieces, and on Saturday night, a gala dinner will be coupled with an auction of selected high quality items. An instant gallery showcasing the best work of SA turners will be on display for the duration of the congress. Members of the AWSA are encouraged to donate quality items for the charity auction. 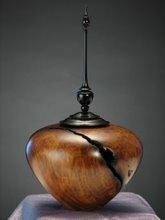 As is customary, selected high-quality turnings will be auctioned in a full-blown (Izak-style) auction during the gala dinner on Saturday. And of course, there will be the ever-popular raffle with dozens of prizes generously donated by our sponsors. • The gala dinner and auction on Saturday night. The full breakdown of costs is available in the attached registration form. Several combinations of the above activities are available for late arrivals, day visitors and non members. Details of the breakdown for selected attendance are available on the attached registration form where you can indicate your specific preferences. If you have friends who wish to attend, you can pass this on to them, and they can either join the Association, or attend individual day events. Is available at the Jan van Riebeeck High School (Tel: 021 423 6347), at a reasonable cost of R120 per person, bed & breakfast. Bedding is included. Limited accommodation has been reserved, so early booking is essential. First come first served! AWSA members will be given preference for the hostel accommodation, and non-members will be put on a waitlist. Delegates must book their own accommodation directly through the school. Contact persons at the school were Carol or Isabel. ABSA account 0360420035 Branch number 312109. ABSA Adderley street, Cape Town. 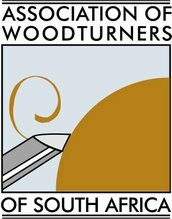 Note: Write 'Houtdraaiers' or 'Woodturners' clearly on bank receipt and fax to the school. When booking accommodation, delegates must specify any special dietary requirements. (2 minutes from school), 6 Stephen Street, Gardens. They have 13 double rooms and will give AWSA delegates their winter tariff of R1 100 / room per night. This is more or less standard for the area. There are also several other B&Bs, guest houses, hotels, etc. in the vicinity, which can be located via the internet if you Google “accommodation tamboerskloof”. Members are responsible for their own travel arrangements to and from Cape Town. For those travelling by public transport, transfers will be arranged from the airport/nearest station. Hugh Scholtz (021 913 0417) will coordinate shuttles so please confirm your arrival and departure details with him. For the more cost conscious, alternatives to flying (cheapest option here is to book online) or travelling by car, would be by mainliner coach or rail. Check with your local agent for exact costs. Book soon! This year we have decided to break completely with tradition, and instead of shirts or smocks, delegates will receive a stainless steel lidded coffee mug as a memento of this year’s congress. As there are still a number of smocks available from last year, and these will be on sale again this year. 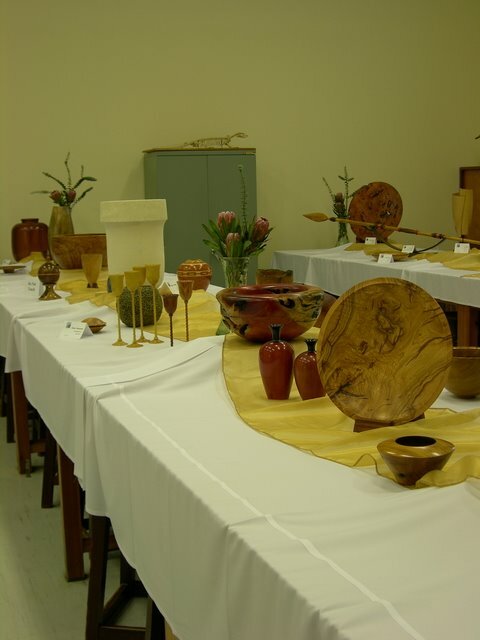 These high quality woodturning smocks available to Congress attendees, at a cost of R 170.00 each. Please make sure to pre-order your size (first-come-first-served) to avoid disappointment. 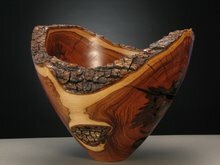 An instant gallery will be on display, representing the best of South African turnings. Each member can submit up to three items, which may or may not be marked for sale. Each member may indicate one item for the critique evening, where our international guest will discuss the pieces on display, assisted by two local artists. As has become the tradition, we are seeking donations of quality items to raise money for charity. On Saturday evening selected top quality items will be auctioned in the normal lively manner during the gala dinner evening, so bring the piggybank! For once, size does not matter! 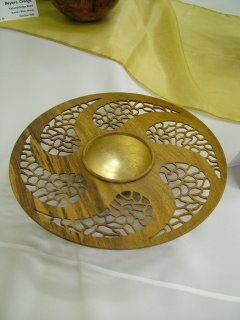 Schalk’s Challenge for AWSA Congress 2007 is a little more complex this time, as turners are required to make use of both faceplate and spindle turning techniques, and they must include at least two identical spindles; namely produce any bowl/vessel and then incorporate at least two identical spindles. So, set to it folks, and put your thinking caps on, have the muse kiss you, and create something beautiful/interesting/ intriguing for next year’s congress. Remember, you do not have to attend the congress for your work to be entered; if you really can’t make in person due to other commitments, your works are welcome to get here without you in attendance. The contact persons at the school were Carol or Isabel. - see 'Accommodation' for further details.